Anon. Sale, Hôtel des Ventes, Avranches, 16 April 1995, lot 72. H. Voss, 'François Boucher's early development', Burlington Magazine, March 1953, p. 82, fig. 38. A. Laing, in the exhibition catalogue, François Boucher 1703-1770, 1986-1987, p. 112, under cat no. 9. 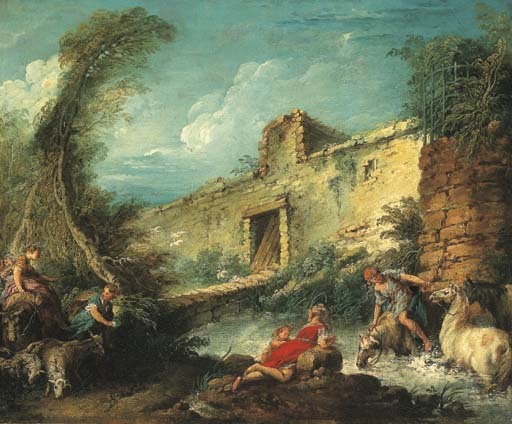 This lively landscape, formerly attributed to Fragonard, was first recognized as an early painting from Boucher's hand by Hermann Voss in his seminal study of the artist's early development. Although Voss did not attempt to date the painting precisely, Alastair Laing more recently has proposed that it is one of the Lemoyne-inspired landscapes produced by the young artist before his departure for Italy in 1728, or possibly an example of the "tableaux précieux à la manière des Flamands" that Papillon de La Ferté (1776) asserts Boucher made while he was studying at the French Academy in Rome (1728-1731). Certainly, its light, high-keyed palette, rapidly whipped brushwork and energetic melange of influences is in keeping with a small group of other paintings by the artist from the mid- to late 1720s, including the recently rediscovered masterpiece The Judgment of Susanna (National Gallery of Canada, Ottawa), Mutius Scaevola putting his hand in the fire (Musée Sandelin, Saint-Omer) and La fontaine (J.B. Speed Art Museum, Louisville). It seems that by the time of his arrival in Rome, Boucher had become something of a specialist in rural genre paintings in the Dutch taste, in which peasant figures styled on the manner of the Utrecht painter Abraham Bloemaert were set into vaguely Italianate landscapes. In the present landscape, not only has the young Boucher looked to figures from the works of Bloemaert and the Genoese artist Giovanni Benedetto Castiglione for inspiration, but he has adopted the palette of contemporary Venetian colorists like Gian Antonio Pellegrini, whose paintings he could have seen in Paris. Nevertheless, the most vivid influence remains that of Boucher's master, François Lemoyne, whose own sparkling pastorals were characterized by feathery and gently curving trees, light-filled glades and picturesque architectural elements adapted from Titian and Watteau. From the start, Boucher pressed this manner to an extreme, creating in works like 'Le passage du gué' an original, picturesque vision of a highly theatrical and artificial Nature. His new 'genre pittoresque' came to define the rococo sensibility where, as Laing has observed, "landscape predominates over the figures and is characterized by exaggeratedly plunging effects of perspective recession and by vegetation of almost demented vitality...". We are grateful to Alastair Laing for his assistance in preparing this entry.